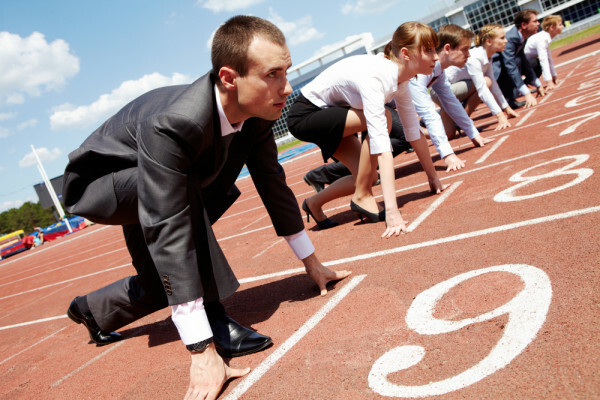 Are you competitive? How are you creating your competitive edge? Would you say that you are the leader of the pack? Beating out your competition? When was the last time you thought about it? One of my favorite types of professionals to work with is the financial advisor. Why? They understand that in order to take their production to the next level they must invest in themselves and their business. The investment is a combination of hiring associates to delegate to and free up time to find and help more people, hiring a personal trainer to stay physically fit and have a higher degree of self-confidence, and hiring professional consultants, i.e. life coaches, LinkedIn trainers, etc., who can help them tap into opportunities they may be missing and equip them to navigate new opportunities. Financial representatives are highly motivated and are driven to excel in all endeavors they pursue…the successful ones anyway. Disclaimer: Do the above attributes apply to you even though you’re not a financial advisor? We think that is fantastic. We know there are a ton of professionals out there who live out those characteristics every day, and who are pretty darn successful in their careers too. This blog post is for you also. Reason #1: People are looking for you…scratch that. People are looking to hire you as their next financial advisor. These potential business opportunities are calling their friends to vet you and they are looking online to vet you. So, you don’t think they have a LinkedIn account? Doesn’t matter. Why? LinkedIn and Google love each other. That’s right. People do not have to have a LinkedIn account to see your public profile. Are you on LinkedIn? Have you Googled your name recently? Go ahead and try it. If you’re on LinkedIn, I bet one of the top search results that comes up will be your LinkedIn profile. You see, it is our responsibility to make sure that we are representing ourselves accurately and completely when people find us online. And hey, all we’re going for is to look reasonably intelligent. Building your LinkedIn profile is a critical component to your success. Not just your success on LinkedIn; your success, period. There are more than two people joining the LinkedIn global network every second. These individuals account for more than 187 million unique visits to LinkedIn each month. We have published many posts on the topic of the LinkedIn Profile, but if you want more direct assistance with the topic, let us know. We have built dozens and dozens of professional LinkedIn profiles to help elevate you to the next level. Don’t you want to make sure that the reputation you have offline in your business community is mirrored online when people find you? Reason #2: Your competitors are using LinkedIn to find more clients. Those stats get me excited. What an opportunity you have! Even if you want to fight the numbers, let’s turn it around: If you thought that your competitors were not using LinkedIn, wouldn’t you want to be where they aren’t? I think so. Capitalize on their lack of knowledge to tap into an abundance of potential conversations. So, let’s revisit: LinkedIn provides great opportunities! If you want to be ahead of the game, don’t wait because your competitors are bound to catch up, if they aren’t already at the game. You are not using LinkedIn to sell for you. You are using LinkedIn as an entry point for conversations. In six weeks I generated 38 in-person meetings that were initiated on LinkedIn. How did I average almost 7 new meetings each week? I was proactive with what was sitting in my LinkedIn account (i.e. pending invitations, messages, profile views, etc.). Instead of just expecting meetings to fall from the sky, I actually asked to talk with people before just accepting them into my network. Reason #3: You can manage more relationships…a.k.a. create more opportunities. Understand who is in your network. Take your offline network and bring them online. 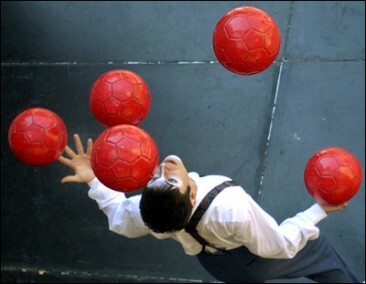 I don’t know about you, but my brain can only juggle so many relationships at one time. I use LinkedIn as my database. When you are able to understand who is in your network, you can then begin to understand how to tap into it. I don’t believe in making cold calls. Yes, you read that correctly. If you are an exceptional professional who people love to hire for your expertise, and if you are authentically building your network with strong ties, you should be able to ask for introductions. Introductions change your would-be-cold calls into warm calls. You have to identify centers of influence in your network that will be likely to create introductions for you. Isn’t it nice to know when people are thinking about you? LinkedIn gives you the insight you need to stay top of mind with your connections. From birthdays to job promotions, sending a quick note can go a long way. Why would you use LinkedIn over email? LinkedIn messages have an 85% open rate over basic email. When you use LinkedIn to meet more people and stay top of mind you have a great chance of filling your calendar with calls and meetings faster than you can keep up. 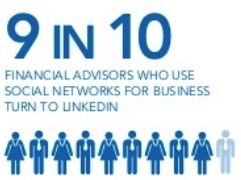 LinkedIn even writes about how individuals can use LinkedIn to find a financial advisor. You are not exempt. If you are not connecting with your clients and prospects, you better believe that your competition is gunning for them. Bring your offline relationships online so you can get introduced to more potential clients. Chances are, your network is significantly bigger than you think. What are other ways you are using LinkedIn to drum up more conversations and build more relationships?